Summary GlobalMeet is a web conferencing product aimed at businesses, but poorly equipped to compete against better known products. Web-based conferencing continues to be out of the reach of many people. But solutions continue to drop in price as cloud computing continues to help push scale and reduce operating costs. Today we take a look at GlobalMeet, a product by the makers of the recently reviewed iMeet. iMeet had a number of stumbling blocks, mainly that it was missing a number of video conferencing features that are useful when having meetings. GlobalMeet is the older, more mature sibling of iMeet. It was designed with the business user in mind, so has a number of features that we had been looking for in iMeet. Such features include: a virtual whiteboard, presentation mode (showing Powerpoints), more fine-grained user control chat, and an all around less cutesy interface. GlobalMeet offers a well-rounded feature set. Video Chat, text chat, and audio conferencing are all available. However, video chat does not include audio, so even the presenter must be on the phone to talk. Files can be uploaded and shared among participants and Powerpoint presentations can be uploaded and used as a presentation aid. A virtual whiteboard is also available, and you can choose to allow conference guests to write on it. Guests can also be promoted to presenters, although this makes for some wonky video chat, as I'll explain in a bit. Screen sharing is among the features, as is the ability to record a conference. Finally, GlobalMeet has the ability to call guests to join the audio conference, which avoids the whole "Please enter your participant passcode" bit. All this is available for $39 per account, where an account is equivalent to one meeting room, basically. There are some limitations;you only get 1000 minutes of audio per conference and only 125 participants can join per meeting. Additional audio minutes are available for $25 per 2,000 minutes. Additional accounts are $39 an account, but there are "bulk" discounts. A 30-day trial is available, but requires a credit card. Setup involves signing up for an account and logging into the web site the first time. There doesn't seem to be a way to get to your meeting room from any account screen, so you'll have to hold onto the URL that GlobalMeet sends you. When you create a new "meeting", you can choose to invite attendees, and add their phone numbers so that GlobalMeet will call them. Attendees can add their own phone numbers as well when joining the conference. Attendees are required to create accounts to join the conference. This seems to be a thing with PGI (GlobalMeet and iMeet's parent company), but it's honestly an annoyance. I've been a long-time Webex user, and I don't think I've ever had to sign up for an account unless it was to purchase service. Once you get the attendees in place, it becomes evident that GlobalMeet really isn't designed for ad-hoc meetings. Screen sharing is probably the best example, since it requires you to download and install an Windows application (no OS X support) to make it work. Now, this application is actually a Java application, which, last time I checked, was deployable through a browser. So why force an installation? The audio quality during the entire hour Tim and I tested was horrible. I used my cellphone, and Tim went techy and called in using Skype. By horrible, I mean it was actually better than iMeet's audio, which was downright abysmal. But with the phone connections we used, quality should have been fantastic, or at least better than it was. Video quality was equally better than iMeet, but not great. I use a Logitech C910 HD Webcam, which you can see flexing its HD muscles over in the Nefsis review. However, video over GlobalMeet was grainy, pixelated, and poorly exposed, even after I tweaked my normally well-adjusted webcam default exposure and contrast controls. Just to make sure, I kept popping into Skype to make sure I wasn't crazy that the video quality was just that bad in GlobalMeet. The home screen once logged into a conference. Joining a live conference for an attendee. Trying to share your screen at first results in this lovely error. After installing, Appshare loads correctly. Appshare (aka screen sharing) isn't even signed correctly. You can annotate on the screen using app sharing during the conference. You can't unfortunately save any of the annotations though, but you can finagle a screen shot (like here). The conference whiteboard is basic, and works. Full screen isn't anything to write home about. It merely alters the interface. Uploading a powerpoint or file looks fairly easy. Except it doesn't actually show anything when done. The aforementioned Powerpoint support was non-existent. There was a button clearly defined to upload files and use them for presentations. But I must have uploaded my test PPTX file about 10 times before giving up. It simply refused to show up in the system. I had no problems with this file in Nefsis, so it looks like a GlobalMeet issue. Promoting Tim to presenter status allowed him to turn on his Webcam, except this produced some weird results. 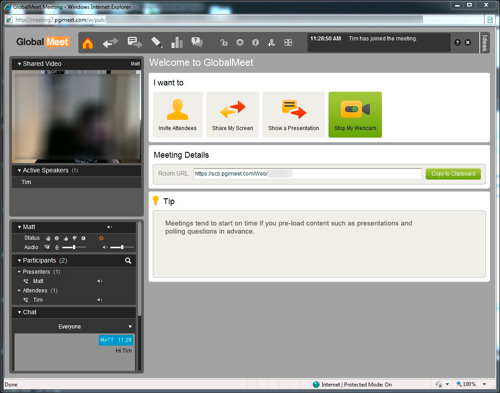 GlobalMeet tries to indicate (similar to iMeet) who is currently talking, and this includes multiple presenters. When someone is talking, their camera gets switched to being viewed by the entire conference. However, switching is not terribly fast, so fast-paced discussions will confuse the system. Access is primarily via the web. You can just join the audio conference through a phone, and there's an iOS app that I didn't try since the software was unbearable enough on the web interface. I didn't even want to bother wasting more time and pulling out more hair. Support comes in the form of a website that contains Tutorials, FAQs, and a User Guide. The user guide is decent, and the FAQs do have some decent Q&A in them. There is also the ability in-conference to have a support representative join the conference to assist with an issue. Security is fairly standard, with all communication passing over an SSL-encrypted connection. The screen sharing tool required a UAC elevaton on Windows 7, but I'm unsure of what it installed that would require that. Files are most likely stored unencrypted, but that's just a guess, since it's undocumented on the site. Overall, there are better options than GlobalMeet. Cisco recently reduced Webex's costs to $49 a month per presenter, and that requires no downloads or anything like that on either the client or the host machine. Yes, Webex does require a plugin, but the plugin is much easier to install, and is innocuous on the system. I would take a look at either Webex or GoToMeeting before jumping in with GlobalMeet.